Brian McClendon talks with the Lawrence Journal-World on Wednesday, April 12, 2017, at the News Center. McClendon, a Lawrence native and University of Kansas graduate, was previously a vice president at Uber and Google, and co-founded Google Earth. Topeka ? A former tech executive who grew up in Lawrence and currently works at the University of Kansas says he has filed to run for Kansas secretary of state in 2018. Brian McClendon, 53, filed paperwork Monday to name a campaign treasurer to run as a Democrat for secretary of state in the 2018 election. A native of Lawrence, McClendon has served as a vice president of Google and Uber, and he developed the software that eventually became Google Earth. 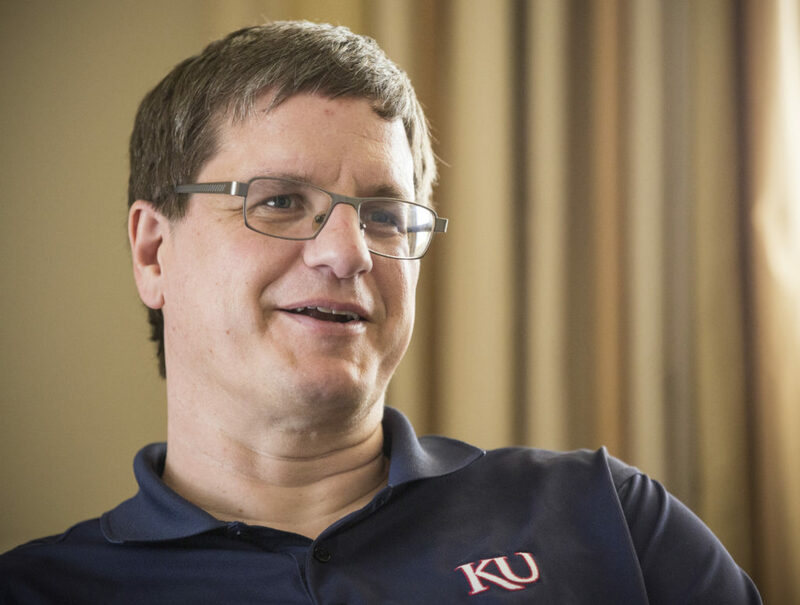 He moved back to Lawrence after leaving Uber in March 2017 and joined KU as a research professor in electrical engineering and computer science. He is a 1986 graduate of the University of Kansas where he earned a bachelor’s degree in electrical engineering. He became the second major Democratic candidate in the race, and will face Sen. Marci Francisco, D-Lawrence, in a Democratic primary. Lucy Steyer, a 17-year-old high school student from Lenexa, has also filed paperwork to get into the race, taking advantage of Kansas’ lack of an age requirement to run for statewide office. Francisco said in an interview that she welcomed McClendon into the race. McClendon said he wants to bring his background in technology to all aspects of the secretary of state’s office, from corporate business filings to elections. But it’s in the area of elections where he said he has the most concerns, particularly the current law requiring people to show proof of U.S. citizenship in order to register to vote. That law was championed in 2011 by incumbent Secretary of State Kris Kobach, a Republican who is running for governor this year. There are also three Republicans vying for the GOP nomination for the office: Kansas Republican Party Chairman Kelly Arnold of Wichita; Kansas House Speaker Pro Tem Scott Schwab of Olathe; and Rep. Keith Esau, also of Olathe. In a separate interview Monday, Esau said he wasn’t concerned about McClendon’s entry into the race, despite his perceived ability to largely self-fund his own campaign. McClendon’s website lists former Lawrence mayor, state senator and longtime Kansas Insurance Commissioner Sandy Praeger as his campaign’s treasurer.